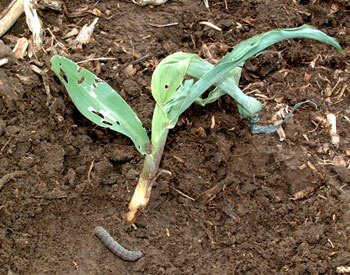 Q&A: Are Cutworms Likely to be a Big Problem in Corn in 2014? Q: Do you have a prediction for cutworm in corn for this spring? I haven't been able to find a good website or other resource. A: Robert Wright, Extension Entomologist: Several cutworm species in Nebraska may damage corn, so it is hard to make an overall prediction. Most people concentrate on the black cutworm because it is more common in the eastern Corn Belt, but is not necessarily the most common cutworm in Nebraska. Black cutworms do not overwinter in Nebraska, but the moths fly up from the south in the late spring. Depending on the wind direction and population levels to the south of us, we may or may not have high populations in Nebraska, most commonly in the eastern third of the state. Pheromone trapping of the moths can be used to predict when black cutworm larvae will be big enough to cut plants, but traps can't predict cutworm levels in individual fields. Our basic recommendation is to scout corn as it emerges and treat postemergence if necessary. Neonicotinoid seed treatments (Cruiser and Poncho) and some Bt corn traits are labeled for control of black cutworm, but high populations may overwhelm them, and the other cutworm species in Nebraska overwinter as partly grown caterpillars and are harder to kill with seed treatments or Bt corn. For more information on corn cutworms in Nebraska, see the UNL NebGuide, Corn Cutworms.